Having an optimistic outlook is easy when things are going your way. But when life takes an unexpected turn, keeping your chin up is easier said than done. And sometimes you just don't want to see the silver lining; sometimes all you want to do is wallow in your misery. A pity party, however, is not going to solve your problems. In fact, it may just make them worse. Research has shown that a negative point of view is associated with poorer physical and mental health, less success, more relationship problems, insufficient coping skills, and even a shorter lifespan. This means if you're suffering from a chronic disease, such as HIV or cancer, keeping your spirits up is particularly important! So just how do you focus on the positive when everything in your life seems to be going south? Easy: you choose sunny-side up. Of course, there will be bad days. And you won't always be a bouncing ray of sunshine. But with an optimistic attitude, you'll know that life has ups and downs and you'll be able to deal with them and move on. Be self-aware. Your explanatory style is an automatic process. You react how you react because you've been doing it for so long. In order to become more optimistic, you'll have to learn to recognize when or why you think negatively or experience negative emotions. Once you're aware of your thought processes, you can start to change them by implementing the tips below. See setbacks as temporary. If you see negative events as a permanent or a part of your destiny, it paints a fairly gloomy future. When something doesn't go your way, see it as something that will pass or that you will overcome. Don't think of it as the "end of your life" or as "ruining the rest of your life" type of situation. Isolate the incident. Don't see a difficult situation as yet another problem, or as a sign of your shortcomings, or proof that you are a failure. Rather see it as an isolated, specific incident that is disconnected from the rest of your life. Otherwise it will overshadow all that's good in your life. Know when to take it personally. When things go wrong, don't take it personally. Sometimes things just go wrong. It's the way it is. And, it happens to everyone. Don't dwell on it. Rather pat yourself on the back when things do turn out the way you want! Know that you always have a choice. Feeling helpless is a sure way to dampen the spirits. Know that you always have a choice. You may not like the available options, but you do have a choice. Get the negative out of your system. Just because you're going to be more optimistic doesn't mean that you won't experience any negativity at all. You will. But it's what you do with it that's important. When you are feeling down, don't criticize yourself for it. Allow yourself to feel negative emotions, but realize that they will pass. Then, go out and punch a boxing bag, do some yoga, meditate, or find a drum to beat, possibly anything that provides a healthy release for your emotions. It's all in your mind. "Good" and "bad" only exists in your perception of the situation. So, if you don't label it is "bad", you won't feel so negative about it. In fact, try to replace all negative words and phrases with positive ones. You'll be surprised at the difference your words can make. Replace emotion with motion. 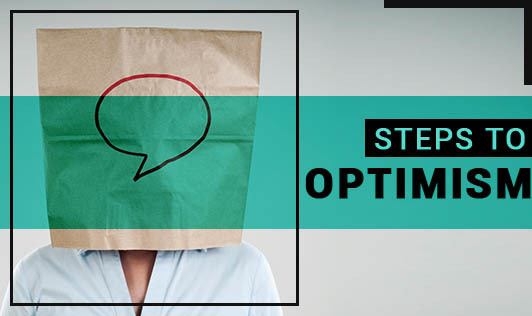 Optimism isn't a magic potion that will make you happier or healthier. You can't simply wish for the best and then sit back and wait for it to come to you. It's wonderful to expect a good outcome, but you have to work hard to achieve it! Be fluid and flexible. You need to be able to reassess your goals or a situation when things don't work out as you had planned, so that you can adapt your plan of action. It's no good hanging on to blind optimism when things are clearly not working out. Look for hidden benefits, set new goals, find new meaning, and move on. Be realistic. Optimism can't overcome overwhelming odds. It won't cure fatal diseases or make poverty disappear. What it can do in these circumstances is help you cope better with the situation. Of course, your disposition won't change from cloudy to sunny overnight. Changing the way you explain the things that happen to you or thinking about the future takes time. But with practice, you'll soon expect the best, prepare for the worst, and celebrate all of it!